As I expect will be the case with many of these Week Without Challenges, the lessons I learned during my week without meat were not limited to the specific challenge at hand. When I first started One Week Without, I received a tweet that read “The door you closed may open a thousand.” If there’s been one lesson that has stuck with me through this process, this has been it. Simply cutting out something as minute in my life as meat (at least that’s how it feels in retrospect), for just one week has revealed how many new, exciting, and delicious experiences that are out there for the taking (and tasting). Yet, I miss out on so much adventure and opportunity in life, blinded by the comfortable habits I’ve developed. Before my week without meat I had fallen into a pretty standard diet: coffee and eggs for breakfast, large-batch chili for lunch, and some sort of chicken for dinner. Experimenting with different dishes in this past week has forced me to try new things, and I found some new things that I liked: mushrooms, spinach and oats, to name a small few. Furthermore, eating a variety of foods is the best way to ensure a healthy diet, at least according to the United States government. Through my week without meat there were certainly some items that I sorely missed, but they were almost entirely extravagances such as ribs, barbecue, burgers, and steaks, certainly not things I eat every day. In contrast, I didn’t miss the more everyday items such as lunchmeat or chicken, basically anything I would usually buy at the grocery store. These meats were easily replaced by vegetarian options, and for the better, both in terms of taste and nutritional value. As a result, I’ve decided to limit my meat intake to special occasions, such as going out to a great restaurant, and keep my every day diet limited to vegetarian options. This not only makes me feel better and lighter every day, it’s also better for my health in the long run. In 2011 Mark Zuckerberg said in an interview with CNN Money, “The only meat I eat is from animals I’ve killed myself.” I was a bit surprised to learn this, as I’d somehow missed the story when it came over the news cycle. As it turns out the Facebook CEO began a challenge to only eat animals which he has killed, presumably with his own bare hands as part of some sort of bestial gauntlet. What one does with this knowledge I think ultimately falls on the hands of each individual, but personally, I’m leaving this challenge choosing not full-scale elimination, but comprehension and moderation, as in all things. This week has energized and encouraged me that the one week without process can really lead to significant growth, even in a short period of time. I can’t want to see how my life changes in the coming months and years, and am envious of the lessons I’ll have learned by then. That said, I am itching to tackle some of the more significant vices I have, and now that we’re a bit further into this, I think it’s time to get a move on. So, on Tuesday (conveniently the day after St. Patrick’s Day), I’ll begin One Week Without Alcohol, which will mark the longest I’ve gone without it since high school. I’ve been putting this challenge off for a bit, but there’s never a good time for these things. I’m ready to learn, grow and get on with it. I’m impressed by what you’ve learned so far. Keep up the learning and the sharing! Keep up the great work! I’m encouraged by your efforts in all this. 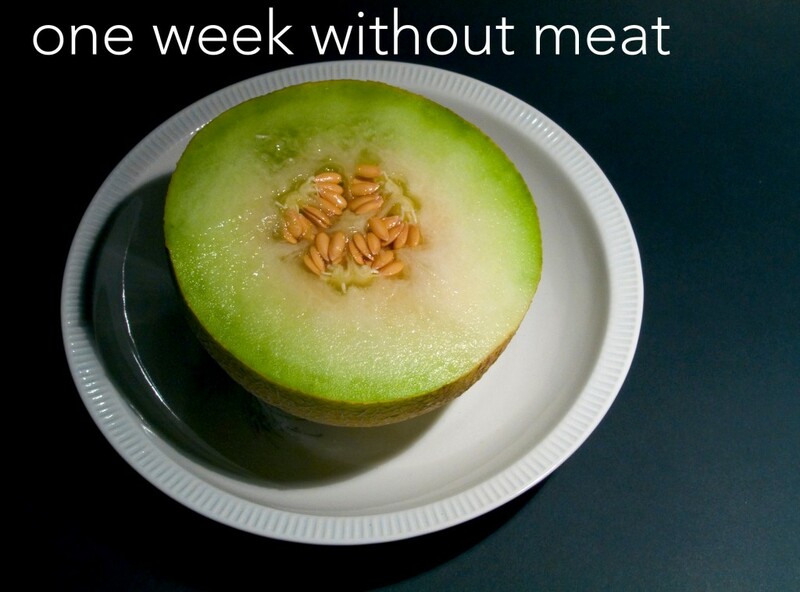 Being a diabetic, it would take some research for me to find some alternatives for the week without meat challenge, but I look forward to giving it a try sometime. It seems like the best course is to avoid added vegetable oils, seek out foods with a low glycemic index (LGI), and opt for high fiber foods. Hope this helps, and thanks again for your support! Interesting. Have you looked much into the science of it all? It is the red pill of nutrition. One thing I’ve learned is that red meat is one of the better options for meats you can eat (but it is still very bad for you). Basically, fish, chicken, eggs, and, of course, bacon are much worst options. Check the site for details. I have to admit, I’ve not looked all that far into it, but what you say about red meat is very interesting, definitely not what I was thinking. I’ll have to dig in a bit more on this, do you know what it was in terms of that red meat was better than those other options? If you’re going to look into it, make sure you read what authoritynutrition.com has to say. After all, you’re the one who first pointed me toward the site.